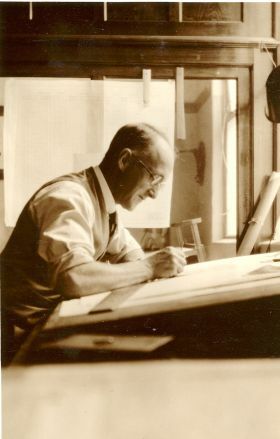 Architects of South Australia is a database of material about the professional lives and contributions of a selection of the state's architects from 1836 to the present day. In addition to providing scholarly biographical information, the database also identifies the architects' principal South Australian built works. Note, however, that the listings are not comprehensive.. The database is the public face of the South Australian Architects and their Works project that was undertaken by a team of academic researchers from the Architecture Museum, Louis Laybourne Smith School of Architecture and Design, University of South Australia, with funding from the Department for Environment and Water. A project Reference Group guided the selection of architects for research in the original project. Since the DEH funded project finished, the database has been added to through the contribution of biographies written by architectural and professional historians and graduate students. Although the built environment is shaped by the work of many professions, the scope of this project is limited to architects. An architect is defined as an individual who, in colonial times, was referred to by that title or, later, one who had either an articled training, an academic education in architecture, or had satisfied the requirements of registration. The list of works provided for each architect is not comprehensive but rather is a selection of principal South Australian built works identified from the sources consulted. The database can be used in two ways. You can either search by architect or by building. Instructions for searching each category are available by clicking on 'Architect search' or 'Building search' in the navigation bar above. The definition of style is highly subjective. The styles referred to in the database are based on those defined by the accepted Australian text on this subject: Apperly, Richard, Irving, Robert, Reynolds, Peter L., and Mitchell, Solomon. (1989) A Pictorial Guide to Identifying Australian Architecture: Styles and Terms from 1788 to the Present. Sydney: Angus & Robertson. Can you provide further information about an architect? To send in additional information or information that can be confirmed from a reliable source please go to 'Contact & Feedback'. Have you researched a South Australian architect who is not represented in the database? Please go to 'Contact & Feedback'.